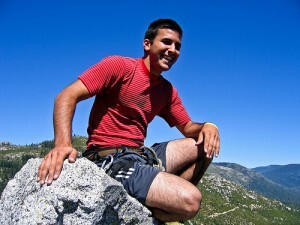 South Lake Tahoe supports year-round rock climbing. Hit up Sugarloaf when a cold front rolls in, opt for Lover’s Leap and Phantom Spires in temperate conditions, or ascend at higher elevations, at Eagle Lake Cliff and Wrights Lake Cliff, to evade Tahoe’s spontaneous, sweltering summer heat. 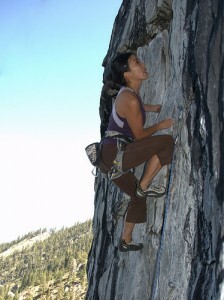 South Lake Tahoe caters to climbers of all types and levels. Trad climbers can push up smooth crags, reminiscent of Yosemite conditions, at Sugarloaf or Eagle Lake, pull on protuberances at Phantom Spires, or lead a multi-pitch route at Lover’s Leap. Sport climbers can fasten bolts at Luther Rock, Luther Spires and Mayhem Cove. Lastly, South Lake Tahoe offers climbs in areas of complete isolation, such as Eagle Creek Cliff and Wrights Lake Cliff, as well as more social spots, like roadside Lover’s Leap and 90-Foot Wall. In this way, South Lake Tahoe accommodates both introvert and extrovert climbers. While climbing in Yosemite can often be a logistical stressor, South Lake Tahoe climbing happens to be haphazard and problem-free. Here in South Lake Tahoe, there are no fees, no reservations necessary, dogs are allowed at all climbing areas, and food joints are nearby. Rather than trek to Yosemite’s overpopulated climbing ground, visit a closer destination, South Lake Tahoe, for archetypal training on numerous 5.6s-5.12s. Sugarloaf is Tahoe’s Mecca for winter cragging. This “part spire, part buttress, part dome, and all loaf” 350 foot, south-facing crag features major crevice and chimney systems, in lieu of Tahoe’s usual knobs, dikes, and big edges. Sugarloaf sits above Highway 50, between Kyburz and Silverfork, about 2.5 hours away from San Francisco, and 30 minutes west of South Lake Tahoe. Driving from the east (South Lake Tahoe), continue 0.6 miles past Kyburz and park in a dirt pullout on the left side across from a phone company building. Expect a steep, strenuous, half-an-hour, uphill hike with 700 feet elevation gain to access Sugarloaf. Start behind the phone company building. Follow a climber’s trail up and to the right, via a split boulder, then proceed up and left to a trail merger with an old 4WD road. Another 100 yards of uphill road presents itself before turning back onto the trail. Sugarloaf is ideal from October to April. Parts of Sugarloaf face east, south, and west, verifying that there are always sections in the sun, while the surrounding trees dampen most of the wind. Snow never sticks long on Sugarloaf – a condition which creates an invigorating day of crisp, winter climbing. This stretch of 15 to 20 granite spires, coated with huge, spaced-out knobs, starts just above Highway 50 and extends 800 vertical feet. About half the climbs are cracks, while the other fifty percent are bolted. If driving from South Lake Tahoe on Highway 50, pass small town Strawberry and continue west for 4.2 miles to Wrights Lake Road. Turn right onto Wrights Lake Road and drive 2.2 miles to a left-hand turn on a dirt logging road, where a view of Phantom Spires becomes observable. Drive another 0.5 miles to the parking area. At the end of the logging road, walk a climbers’ trail west for about five minutes, until you reach Middle Spire and numerous trails leading to neighboring spires. The farthest spires take only about 15 minutes to reach on trail. The weather around Phantom Spires is decent year-round. However, the most ideal months to climb are February – May and September – November, when temperatures are in the 50s and 60s. The spires face in all directions, so escaping sun or wind requires only a short hike to a close-by spire. Wrights Lake Cliff boasts many single-pitch 5.10-5.12s, along a myriad of crack and face routes in a desolate location. If driving from South Lake Tahoe on Highway 50, pass small town Strawberry and continue west for 4.2 miles to Wrights Lake Road. Turn right onto Wrights Lake Road for 8 another miles of driving to Wrights Lake. Here, take the right fork around the lake to Twin Lakes/Grouse Lake trailhead. Hike Twin Lakes/Grouse Lakes trail for half a mile, before it merges with another trail. Walk 50 yards east and search for a 25-foot-tall bluff 200 feet north of the trail. Go round the right side of the bluff, walk for half a mile on the noticeable climbers’ trail, until Wrights Lake Cliff is on your right. 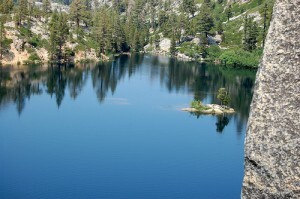 The climbing season at Wrights Lake Cliff is limited by snow coverage on Wrights Lake Road. The road usually closes with the first winter storm and opens sometime in early June. Climbing here on summer mornings or spring and fall afternoons is recommended. Lover’s Leap, a name with no known story of origin, offers some of the country’s best easy and moderate multi-pitch climbing routes. This granite cliff has more large holds than a giant-sized cheese grater. Tad Steele once reported that “Lover’s Leap has a strong ground up tradition – if you fall, you get ground-up.” Lover’s Leap’s signature array of criss-crossed dikes make this steep face a royal stomping ground for trad climbers. From Highway 50 pull into the east end of Strawberry Lodge parking lot, about 20 miles west of South Lake Tahoe. The road veers left and continues over a bridge which crosses the American River. Immediately after the bridge, turn left, and continue up a slender road to the campground. Take the Old Pony Express Trail, 50 feet east of the campground bathrooms, for most of the Lover’s Leap climbs. The ideal climbing seasons at Lover’s Leap are, much like Yosemite, in the spring and fall. When snow is scarce, climbers frequent Lover’s Leap from April to December. However, during a heavy snow year, expect to climb between June and October. Thanks to a pristine setting in Desolation Wilderness, Echo Lakes’ climbs possess sizeable vistas of an aqua lake, blankets of pine trees, and all-encompassing mountains. A boat taxi, accessible at Echo Lakes Marina, cuts down on approach time to the climbs. If driving west on Highway 50 from South Lake Tahoe, turn right onto Echo Lakes Road, 2.7 miles west of the Highway 50 – Highway 89 junction in Meyers. Continue 0.8 miles to a right fork, and drive another 0.6 miles to Echo Lakes Marina. Take the boat taxi, which starts transporting people at 7 a.m., at a cost of $7 per person ($4 for dogs). Ask the driver to drop you off at Mermaid Community Pier where you will link up with Pacific Crest Trail. If your feet are feeling antsy, pick up the Pacific Crest Trail at the marina, after crossing Echo Lake’s outlet, and hike for about 30 minutes along the north shore of the lake. Look to your right for an orange-colored slab, known as Gangsta Wall, and a few hundred feet onward, Old Peculiar. For climbing routes at Berkeley Camp, walk down the driveway from the Berkeley Camp sign and stay to the right of the main building. After another 300 feet, you pass a basketball court on the left and drop down a steep hillside 50 feet to the sport climbs. 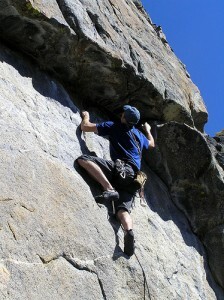 Climbing at Echo Lakes is best in the spring and fall seasons. Summer months might yield intense, all-day sunlight, warming up the exposed face to blistering temperatures. 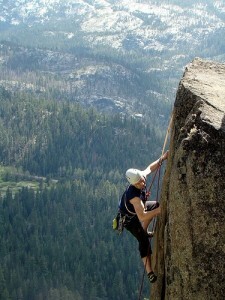 Luther Rock has some of South Lake Tahoe’s finest 5.10-5.11 sport climbing. The granite is surprisingly strange, with several, varied edges, vertical overhangs, and streaks. From the junction of Highway 89 and 50 in Meyers, drive 3.4 miles south on Highway 89 and park in the third paved pullout on the right, just after you start up the grade. Ascend the bank on the opposite side of the road to find the climbers’ trail. The arduous climbers’ trail is 0.5 miles long, gains 900 feet in elevation, and takes 30-40 minutes. At the end of the climbers’ trail, ascend a steep, talus gully. Once level with the cliff you desire to climb (Detox Wall is the lower cliff, Distillery Wall is the upper cliff), move out of the talus gully. 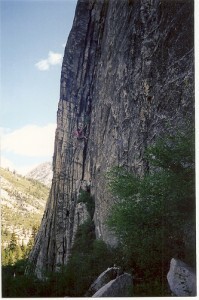 Climbing commences at snowmelt, usually in May, and ends with the first winter storm, approximately in November. These western-facing routes do not get sun until 1 p.m. yielding perfect conditions for climbing on hot summer mornings or spring and fall afternoons. From the junction of Highway 89 and 50 in Meyers, drive well past the Luther Rock pullout to Big Meadow Trailhead. Park on the left side of the Highway 89, 0.4 miles past Big Meadow Trailhead, in a parking area next to several boulders. Follow cairns across the Tahoe Rim Trail to a natural tree bridge. From here, continue on a climbers’ trail, which is well marked with cairns. Like nearby Luther Rock, climbing commences at snowmelt, usually in May, and ends with the first winter storm, approximately in November. These western-facing routes do not get sun until 1 p.m. yielding perfect conditions for climbing on hot summer mornings or spring and fall afternoons. Eagle Creek Canyon seems to have something for every type of climber, from sports climbs in close proximity to the road at Mayhem Cove, to Yosemite-esque crack routes deep in Desolation Wilderness at Eagle Lake Cliff. 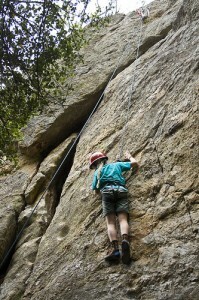 Most routes are suitable to toprope, especially 90-Foot Wall. From the junction of Highway 89 and 50 in South Lake Tahoe at “the Y”, drive 9 miles north on Highway 89/Emerald Bay Road and park at busy Eagle Lakes Trailhead ($3 for parking). Stair-stepping Eagle Lakes trail will guide climbers to Eagle’s Nest, Eagle Lake Cliff, and Eagle Creek Cliff, all nestled south of Eagle Lake. For 90-Foot Wall, hike the Eagle Lakes trail from the parking area, but shortly after the trailhead, turn right onto Eagle Loop trail. Veer right up to the vista point, of which 90-Foot Wall is positioned 100 feet to the west. The approach to Mayhem Cove is quick and easy. Just west of the bathrooms in the parking area, embark on a climbers’ trail that leads west. After several feet, run into a dirt road and turn right, to walk for 300 hundred more yards. Sharing a climbing season with Lover’s Leap, climb at Eagle Creek Canyon from May – November. On sun-scorching days, climb Eagle Lake Cliff or Eagle Creek Wall in the morning and switch to 90-Foot Wall, Mayhem Cove, or Eagle’s Nest in the afternoon. Lover’s Leap Guides offer classes for beginning through advanced climbers, climbers who want to learn how to lead, as well as adaptive climbing lessons. 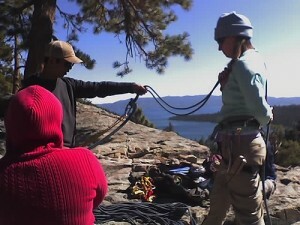 Sierra Mountain Guides offer group and private guiding at Lover’s Leap, along with the rest of the aforementioned Tahoe areas. This veteran climbing company has been guiding at Lover’s Leap since 1977. For supplemental information on South Lake Tahoe climbing routes, reference Supertopo’s South Lake Tahoe Climbing book by Chris McNamara.